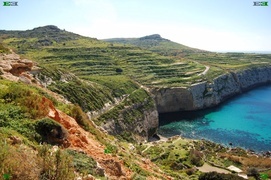 syncline, malta and the problem with geology - what dont you see? A syncline is a fold structure in which the sides of the fold slope together. Its shape is concave upward. Technically, it is a fold with younger rocks on the inside, so technically this should be called a synform until we can confirm the relative ages of the rocks. A syncline this well formed and large (image is several hundred meters vertically) is very unlikely to be in overturned strata. So 99 of 100 geologists would look at this image and say, "Where is that beautiful syncline?" The hundredth might add "—or synformal anticline." (The answer is Ellesmere Island, in the Canadian Arctic.) Synclines can be as small as a hand specimen. Notice that the geologic structure does not much affect the topography. That is, a syncline does not necessarily create a valley. In very young landscapes it might, but generally how a syncline is expressed depends on the rocks. If softer rocks are in the core of the syncline, they will erode to form a valley, but if the inner layers are harder, erosion carves them into a peak instead. What you dont see with most synclines is the geology of the area being effected by the syncline itself. according to geology these have to be caused by immense pressure/folds/energy/stress/time. yet the land itself does not seem to see it or notice that it has a syncline above/below/beside. 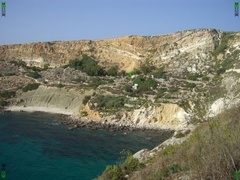 the syncline at fomm ir-rih bay in malta is a classic example. the colour of the rocks show exactly where the altered rock is. what you dont see is this altered rock protruding forwards of the cliff or above the top line of the cliff face. this seems to be the same for the ellesmere syncline also. it looks to be totally different rock yet fits in very nicely, slightly protruding because it has been altered but not by being squeezed by other rocks. what dont you see with the lines of the rock beside it, especially to the right. What dont you see outside of the synclines on malta? You dont see an area of conglomerate rocks/boulders like you find in the top fold center of the syncline. 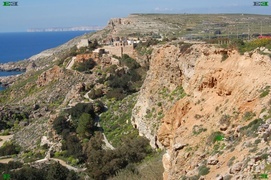 the maltese syncline also has a center of red dirt/rock which is a normal sign of past or present EU activity. 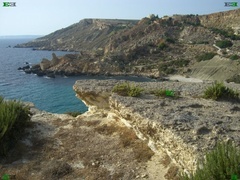 the gEUlogy of fomm ir-rih bay in malta is amazing, considering its just a limestone island. even to the front and sides of the syncline the mineral is different. 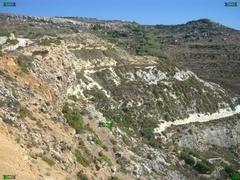 to the right hand side there is a sharp gulley going down the cliff, this seperates the syncline from very different type of rock and land structure. in the image above to the right you can start to see an EU crater that was likely to have been EDM's out of the massive cliff. in the Electric Universe a lot of our geology is WYSIWYG, a lot of it has formed where it is found, not deep underground. when you look at geology it looks like it belongs where it is. it might be strange but it does not look like it has come up from the ground or been eroded away. how can synclines be formed in an Electric Universe? no one really knows but perhaps one idea could be shock waves. as strange as it sounds what do you see? are synclines formed by shockwaves in an electric universe? ?What Dont You See with the Barstow syncline, Rainbow Basin, California? The Barstow Syncline is especially interesting since it also clearly shows an unconformity across its top. Uncomformities are strata of different ages that are in contact, indicating non-continuous deposition and a break in the geologic history of the layers. In this case the uncomformity was created as the syncline was eroded and younger layers were subsequently deposited uncomformably above it. Erosion has revealed the entire structure for all to admire. Barstow Syncline in located in Rainbow Basin in california is a classic example or text book stufy of a syncline. yet it shows strange features. notice that the changed red rock does not protrude mcuh further above or in front of the rest of the rock. that it also seems to stop at a very flat level, where you suspect the ground level to have been or something like that. The Ellesmere island syncline is obviously an impact of some kind. You can see the "fractures" after the impact. Also the fractures are balanced on either side as specific angles. The compression could have been caused by the extreme heat caused by a lightning bolt. They can have up to 50,000 times the heat of the surface of the sun. This means that a lightning bolt can have up to 300,000,000 degrees Kalvin of heat. I think that is more then enough to melt solid rock and form layering. Not to mention this would happen instantly and the stone would need time to cool. There should be rare minerals in those hills. I'm going to have to research this a little more but I can see through electric eyes. I don't see through gravity eyes! What a great representation of electrical discharge across the Earth. Didn't know where I was in this posh new place, impressive. Gravity is what is not seen, or what causes the effect We call gravity.? the ellesmere island syncline does not appear to be a "normal syncline", if anyone has photographs of anything similar please let me know. so parts of the electric universe geology discussion below may only apply to the ellesmere syncline and not others. there may be a number of ways that the ellesmere island syncline could have been formed by gEUlogy, below are some ideas for its creation. there are likely to be many others but these we can start to explain in an Electric Universe. it could also be a mixture of these below or multiple events over time. megalightning has seemed to strike the earth on many occasions, according to ancient myths and legends and seemingly from evidence on the ground. has it caused the ellesmere island syncline? i am not sure that a single strike or multiple strikes could have caused it due to the pattern of the syncline and what we can see. there may have been thunderbolts of the gods involved but not as the driving force for its formation. for an area to create a lichtenberg pattern it normally needs to be charged over time. is the ellesmere syncline that point? did a birkeland current or some form of long term plasma discharge "stick" to this point? although a thunderbolt of the god (interplanetary lightning) must have been able to charge the local area up does the area need a long term charge time to create enough back EMF? electromagnetic field lines create curved patterns. the shape of the ellesmere syncline suggests a curved electromagnetic field. what sort of circuit could it have been? was it just one circuit? is it still happening now? mountains are the result of immense electromagnetic forces as seen by their lichtenberg pattern. this is the same for most rocks and explains the geology puzzle of metamorphosis. rocks that have totally changed or been replaced. as long as a theory can supply the force and the conditions then it may be true. geology needs the rocks to be underground, under immense pressure and heat for millions of years then to come up to the surface and then be eroded away. if minerals/rocks/mountains are formed by gEUlogy then the object can be partially transformed/transmuted but if the process stops (the flow of the current stops) then it may remain a mixture. does the ellesmere island syncline show the start of the next stage of the mineral transformation of the mountains/hills in the area? or did a surge start to transmute it? who knows how the ellesmere syncline was formed but we can and need to start to try to explain it. we have to be open to every and any idea as long as they are based on some sort of logic. those that challenge any theory put forward, as long as they have logic or evidence, should be especially considered. the only way any idea or theory can be proved true or correct is by it being challenged and able to stand up to the questioning. if it can not withstand a logic attack then it was not worthy. does the formation of the area around the ellesmere syncline give clues as to what formed the area and the syncline? does the photograph of the area from the air show that each hilltop is its own negative or positive lichtenberg discharge? was the area initially created like this or did a lichtenberg pattern occur and then each high point was later transformed into a negative or positive lichtenberg pattern? the problem with the ellesmere island syncline is that, at the moment, there only seems to be 1 close up colour photograph of the syncline. so we are very limited by what we do see. what do we see? here is what i initally see, what do you see? the top of the syncline goes upwards into 2 bumps that are slightly higher than the middle part of the syncline. the middle and top section of the syncline seems to be more solid or melted but there are what seem to be a couple of curves of dark material amongst the red rock (the red/orange limestone/rock of EU activity). at the right side edge of the red rock it seems to either be stratifying as it gets further away, or, not melted so much and we see the original rock in its layers. the rock to the right is in very defined layers. but has a couple of "dykes" or dark discharge cones going diagonal downwards. there seems to be a rogue orange sandstone part to the image. on the right hand side it is a very straight line with a couple of intruders to/from the main synclne top. does it then carry on straight down or does it or another part curve up to the top left? 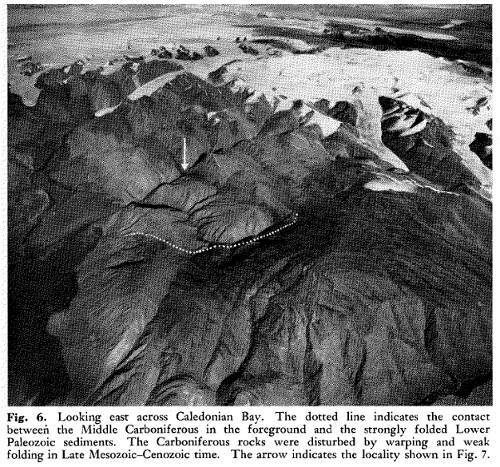 there is an old geology report of the ellesmere island syncline (-geological investigations in ellesmere island, 1952 (pdf) - that give us more information. below is an extract from that report (slightly fuller extract here). it describes the area around caledonian bay. South of Caledonian Bay there is a large syncline which seems to be separated from the large anticline by a major fault. The syncline is composed of fossiliferous limestones, shales, and sandstones ... Until the study of the collections has been completed this comparison cannot profitably be carried any further, but it is certain that Silurian fossils occur in the syncline. Although the folding of the Lower Paleozoic strata around Caledonian Bay has been rather intensive, no metamorphic rocks above the rank of slate have been found. Neither were any intrusive rocks observed. Similar conditions are known from northern Ellesmere Island (Troelsen, 1950a). 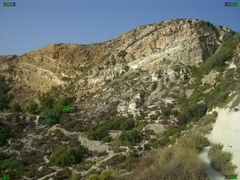 There are therefore good reasons for classifying those parts of the folded mountains which have been examined as belonging to a miogeosyncline. 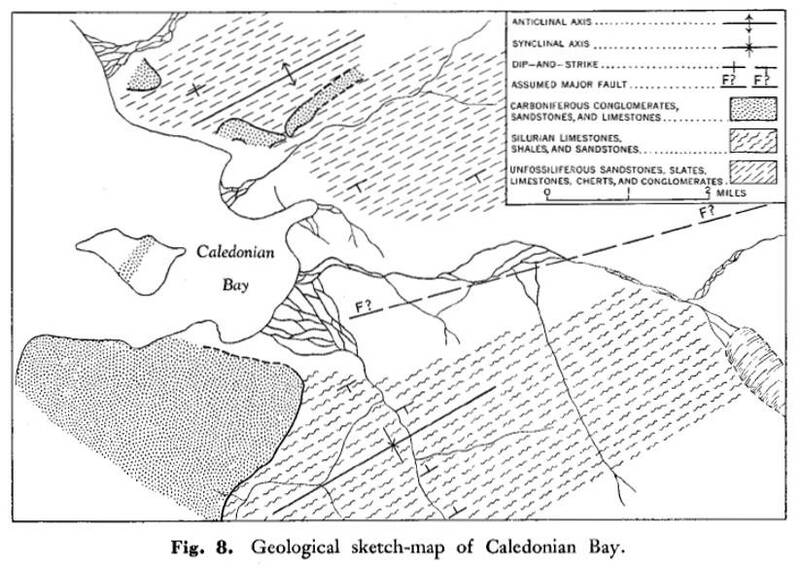 Around Caledonian Bay, Middle Carboniferous sandstones and limestones (with Fusulina and Fusulinella) are found resting upon (1) the folded unfossiliferous sedimentary strata north of the bay and ( 2 ) the folded Silurian sedimentary strata south of the bay. The low island in the bay also consists of Carboniferous rocks. It was definitely proved that the contact between the Carboniferous and the older rocks is an irregular erosion surface overlain by a coarse conglomerate of water-worn pebbles. River gravels, moraines, and the Carboniferous basal conglomerate were also searched unsuccessfully for intrusives and highly metamorphosed rocks. The Carboniferous rocks truncate the older, folded rocks. At one place north of Caledonian Bay, a small erosional valley that parallels the trend of the old anticline was found to have been filled with Carboniferous sandstone... North of Caledonian Bay the erosion has been so thorough that only small patches of the Carboniferous strata have been left here and there on the hill sides. For the first time in Ellesmere Island we thus have positive, irrefutable evidence of a post-Silurian (or possibly Late Silurian) but pre-Middle Carboniferous folding. This, together with what is now known about Peary Land (Troelsen, 1950b), proves the essential correctness of Lauge Koch’s theory as to the age of the folding. 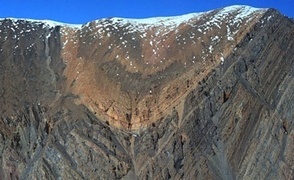 ellesmere island and therefore the syncline are the location of the “Nares Strait problem” which is a gravity anomaly. 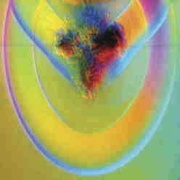 in an electric universe gravity is a biproduct not the main force itself. thats why are mainstream scientists know what it does but not what it is. thats why its called the theory of gravity. in this link wal thornhill explains electric gravity. in the ellesmere island area there is a gravity anomaly. is this due to the gEUlogy creation of the mountains/hills/island/area in the past? is the "Nares Strait problem" due to present electric universe conditions? if gravity is electric and a living, present, instant force that does change. Nares Strait gravity anomaly = electric gravity or past EU event? Abstract: A negative free-air gravity anomaly is associated with Nares Strait, the waterway that separates Ellesmere Island and Greenland. Two east–west gravity profiles that cross Ellesmere Island and Nares Strait were collected. A low with values in the range of ?100 to ?120 mGal (?1000 to ?1200 ?m/s2) was observed, and two-dimensional crustal models were created to identify the cause of the anomaly. The gravity anomaly cannot be attributed wholly to the bathymetry of the strait or to the sedimentary rocks underlying the strait. 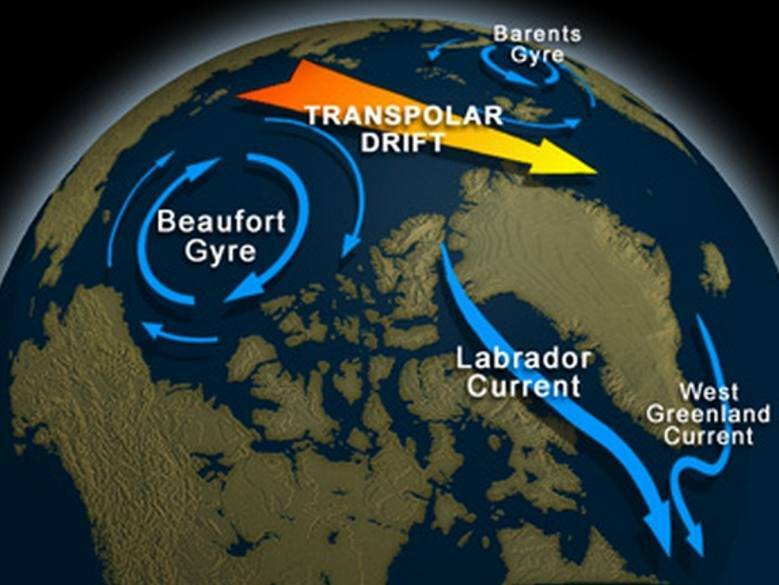 Crustal models that reproduce the anomaly have a M discontinuity that slopes under Nares Strait towards Ellesmere Island so that the crust beneath Ellesmere Island is thickened. The anomaly is similar to those associated with ancient and modern suture zones, regions of collided continental crust. Plate reconstructions suggest Nares Strait is a collisional boundary between the North American Plate (Ellesmere Island) and the Greenland Plate. The gravity anomaly supports this interpretation of Nares Strait.